You are invited to the 2019 February Monthly Meeting on 02/01/2019. Internal Auditors have some of the strongest skills necessary to make an impact on their organizations. The first session will discuss how we can bring out these traits and demonstrate our Leadership skills through coachability, emotional Intelligence, motivation, and temperament. The second session will explore ways Auditors can mount a continuing campaign to sell their products to executive management and the products will be of the quality that will capture and keep management’s interest. Modern internal auditing, to be successful, must be grounded on management support and acceptance and on imaginative service to management. The Chapter will also be offering an “Ethics Course for Texas CPA’s” presented by Allison McLeod, LL.M., JD, CPA, from 1:00 pm -5:00 pm (Lunch will be provided). Please visit the website for additional information. Do not hesitate to register, as spots will fill up fast! This will be a wonderful opportunity for you to network, enhance your skill set, and for professional growth. Registration is now open HERE but hurry, spots will fill up fast! 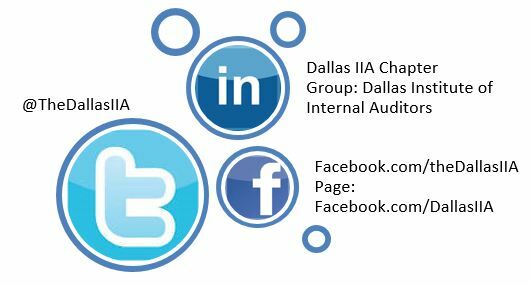 The UT Dallas IAEP is excited to begin this semester! 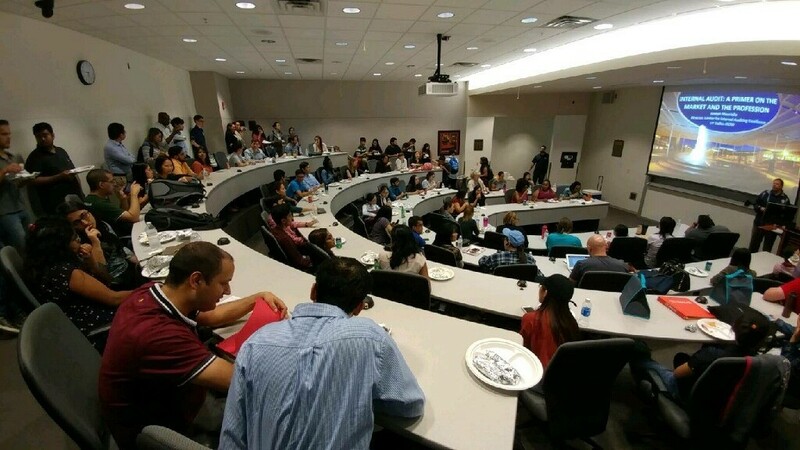 Chapter meetings, social events, and much more are being planned so that our members have a fantastic experience and are provided with exceptional opportunities. At our first meeting for the semester, we look forward to introducing our program to interested students and hope to welcome as many as possible into our chapter. The chapter officers have been visiting many classes to introduce us to new students and answer questions. We are pleasured to have the American International Group (AIG) at our second reception! 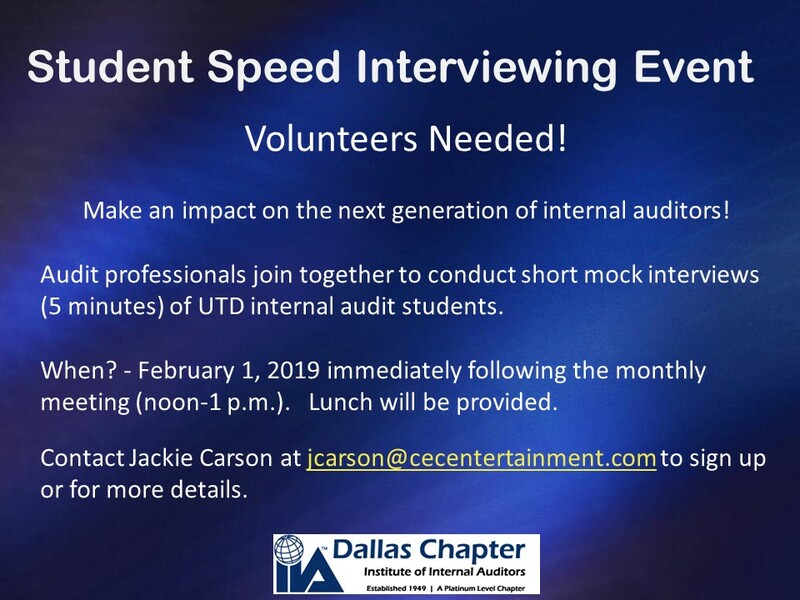 They will be coming to speak to the student chapter about their company, their internal audit department, and any opportunities they may have. The conference will take place over two days. Thursday will consist of your choice of one of the two sessions below and will include lunch, snacks, and beverages. Friday will consist of multiple breakout sessions on varying fraud-related topics and will also include lunch, snacks, and beverages. 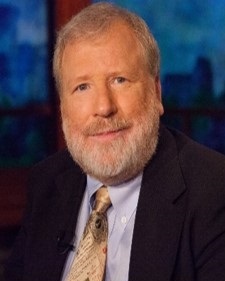 Vizient’s internal audit function underwent its first-ever External Quality Assessment in 2018 earning a rating of “Generally Conforms.” This is the best rating possible indicating that the internal audit team of seven performs its duties in accordance with the IIA’s International Professional Practices Framework (IPPF) commonly known as The Standards. The key pre-EQA activities that were essential to achieving “Generally Conforms” were 1) performing self-assessments and 2) talking to peers about their EQA experiences. One of the biggest lessons we learned, pulling everything together takes longer than you think; conduct your planning with that in mind. Congratulations to Vizient’s internal audit team for completing their External Quality Assessment and demonstrating its commitment to The Standards! In January, chapter members can save 20% off one title published by the Internal Audit Foundation. Visit www.theiia.org/bookstore. This entry was posted on Tuesday, January 22nd, 2019 at 4:56 pm	and is filed under eNews, News and Updates. You can follow any responses to this entry through the RSS 2.0 feed. You can leave a response, or trackback from your own site.